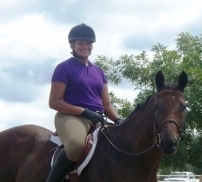 "Our goal is to help people and horses come together and have positive experiences!" Red Oak Farms is available to host your private event including school groups, scout groups working on badges, birthday parties and playgroups. Your event is customized to the ages of the participants and the goals of your group. From educational to pure fun we have many activites to keep your group entertained. Don't forget the campfire cookout option and roast hotdogs and marshmallows over our open campfire! All of our events include a half hour of pony rides. Packages start at $150 for 2 hours. Contact us for pricing, activity information and availablility. We offer one hour private and group lessons to students of all ages. Students can start at any time and progress at their own pace. 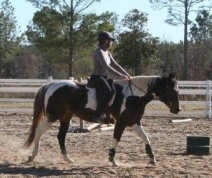 We have a variety of lesson horses available for all ages, riding abilities and discipline. 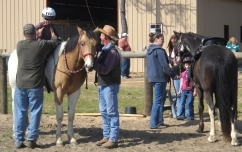 Beginners are taught basic horsemanship and riding skills with a focus on building a strong relationship with their horse. The relationship between horse and horseman is the basis of all of our riding and training programs at Red Oak Farms. Lessons are for all ages and skill levels. If you have never been on a horse before or you are a seasoned competitor we can give you new tools to make the most from your riding experience. Family members can have lessons together as skill levels allow. Amy has taught siblings, husband/wife, grandmother/granddaughter, mom/son, and whole families. Since all riders work at their own pace, everyone can be challenged and cheer each other on with no competition. Individual lessons are $35 per one hour session. We offer a discounted rate to riders who purchase our four lesson package for $110. Off site lessons are an additional $5 per session. 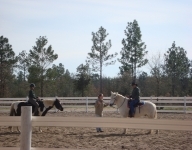 Our lesson rates are priced to allow anyone to enjoy horses. 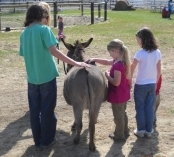 Students can choose to participate in horse shows, trail rides, parades and other events. 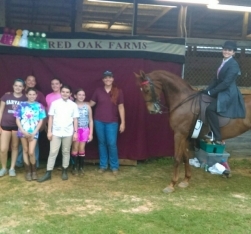 RED OAK FARMS was designed by horse people for horse people. Our top priorities are your horse's safety, comfort, health and happiness with different levels of care available to meet any need. Our Full care board is $400/Mo. 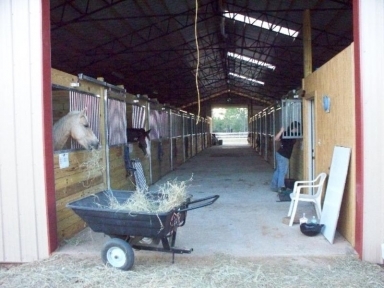 Choice of 12 x 12 stall in the barn or run-in stall with 30'x 30' paddock. Choice of 3 high quality feeds. No one size feeding. Supplements administered daily, fly masks, and fly spray in summmer, meeting vet and farrier. Locally grown hay stored in brand new fully enclosed barn, can store 60+ rolls. 12x12 stalls with rubber mats cleaned EVERY day, fresh bedding added as needed. Automatic waterers in pastures and stalls. 26 stall concrete center aisle barn with 8 sets of breakaway cross ties. 2 indoor concrete wash racks with hot and cold water. Daily turnout in one of 7 two+ acre pastures. Restroom in barn with shower. Boarder Only tackroom, no lesson rider or trainer tack. Seperate feed room, with feed secured. Cavalettis, full set of jumps, barrels, poles, cones, timer, and horse soccer. 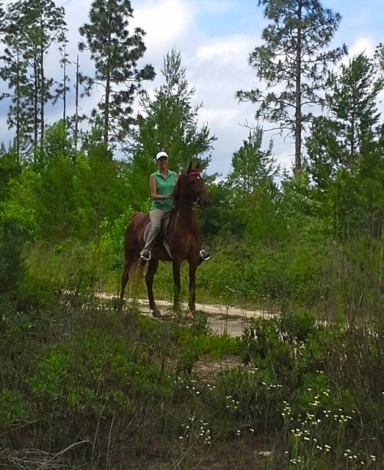 1 mile trail around the property, another mile around the adjacent property and 300 acres available for riding. Safest fencing available today. There are NO t-posts or wire fence at Red Oak Farms. Horses fed and turned out on a regular schedule. Barn Manager living on the premises. Hours of trails around the farm. Horses with special dietary needs or restrictions are always welcome at Red Oak Farms. You can trust that they will receive all feed, supplements and/or medications in a timely and consistent manner. We pride ourselves on maintaining healthy, vibrant horses and helping those that have lost their glow. Here is a photo of Jamie on February 1, 2009 when he arrived here and another on April 1, 2009. 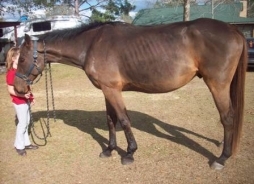 What a difference 2 months of quality feed can do for a horse. He is not on expensive supplements or hard to find products, just quality feed from the local feed store. 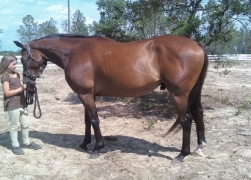 May 2011 - Jamie is now one of our lesson horses and looks great. No one asks what is wrong with him, they just comment on how beautiful he is. June 2017 - Jamie is still with us teaching Dressage and specifically the use of leg aids. 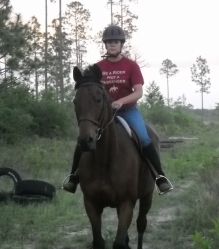 He is an amazing horse. 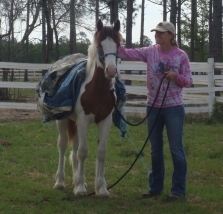 Amy Douglas specializes in helping people get the most from their horse. 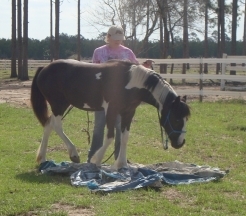 Whether starting young horses or problem solving with older horses, she believes in and uses a restriction-free style of natural horsemanship that encourages success and confidence in your horse. Your horse is never broke-just trained! Amy has helped many people get down the trail or into the show ring. Whatever your goals, we can help you get there. Our goal is to facilitate a stronger relationship between horse and rider in any form of the art of horsemanship. The price ranges from $700-750/mo or $25- 35 per session depending on type of horse and previous training and includes full care board. We customize your horse's training schedule to best suit your goals and expectations. The rider is encouraged to attend as many training sessions as possible. Not many trainers do that. Amy wants you to understand the process and have an effortless transition when you get home. For further details and a free training evaluation please call Amy at 850-722-5400. 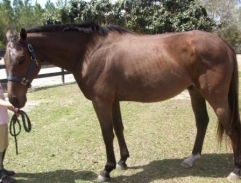 Please click the following link for details on Amy's Horse Biography.